He is missing feathers on the top of his head, not quite a bald patch but still ragged-looking. Birds with completely bald heads have been reported in the breeding season (funny picture and more discussion here), possibly due to mites, and seem to survive fine. This is probably more of an aesthetic than life-and-death issue for ROAR—but when you’re a short-lived bird competing with others to attract females for what may be your only chance at reproduction, aesthetics can mean a lot. ROAR is missing some feathers on the top of his head. ROAR is also missing half of his tail feathers! Some are growing back. ROAR’s tail. A full junco tail has 12 feathers. Note the feathers that are growing back. Oddly, he isn’t missing outside feathers, which are the ones we usually see missing. This might be good for him: males use the white on their tails to signal, with more white being better, so losing non-white feathers is probably better than losing white ones. But with that many tail feathers gone I wouldn’t be surprised if ROAR’s flying is less efficient. Tail feather loss like this may mean that ROAR encountered a predator. 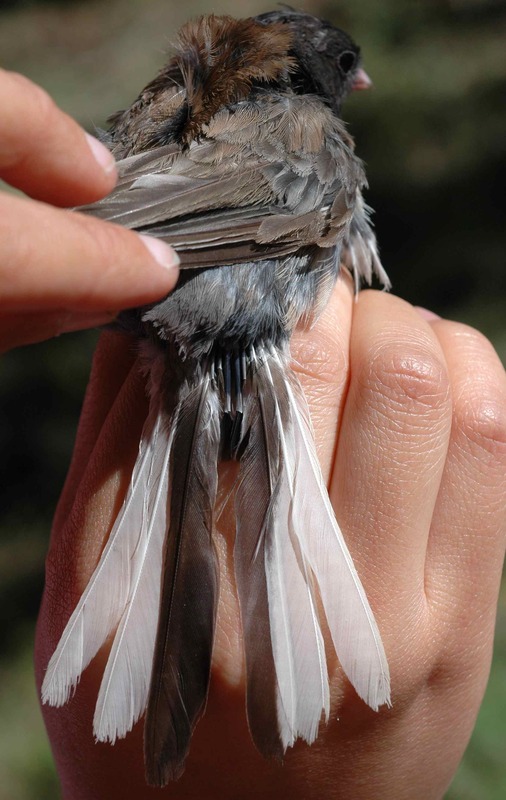 Birds’ feathers are held in the skin more loosely when the bird is stressed, and tail feathers often detach easily. ROAR may have been caught by the tail and have escaped by losing those feathers—in which case his ragged appearance would deserve some respect! 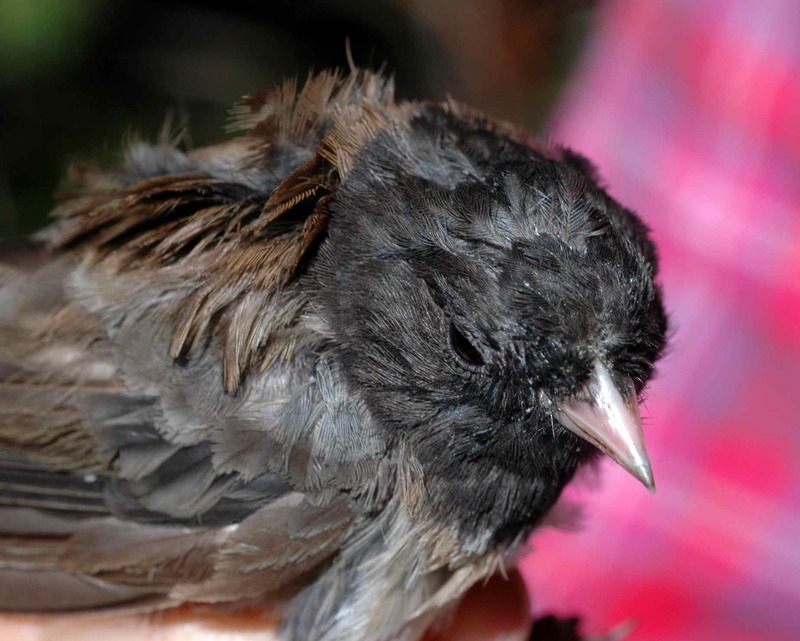 This entry was posted in DEJU, notable juncos and tagged birds, Dark-eyed Junco, feathers, predation, ROAR by toughlittlebirds. Bookmark the permalink.